Grenoble is the main city in the French Alps with..
Grenoble is the main city in the French Alps with around 530,000 inhabitants. It is situated at the junction of three Alpine valleys in a densely populated area that suffers from pollution. In 2007, the city of Grenoble drafted the Energy Action Plan, in line with the Metropolitan Climate Plan, with the aim of cutting greenhouse gas (GHG) emissions by 20 % by 2050. As a lot of GHG emissions in Grenoble stem from buildings, the city has intensified its efforts in this sector in recent years. The maximum, primary energy consumption for new buildings has been limited to 60 kWh/m² and the existing building stock should reduce its energy consumption by 60 % by 2050. To reach this goal, the city is taking both the energy generation and the energy consumption side into consideration, e.g. the fossil fuel used for district heating has been replaced by wood biomass, whilst hydropower and photovoltaic (PV) plants deliver renewable electricity. The district of Caserne de Bonne is a good example that shows the transformation of dreary army barracks into a trendsetting, new eco-district. Besides residential buildings, there are also shops, offices, a school, an old people`s home, a cinema, large parks and gardens that form part of the new district. In the SESAC project, nine new multi-storey buildings with 435 apartments were built in de Bonne. These buildings are supplied with heat and electricity by nine mini CHP plants with the expected final energy consumption being 30-40 % below the applicable national indices. The design of these buildings includes compact dimensions, specific insulation values, double-flow ventilation, as well as water- and light-efficient equipment. In addition to this, 12 new eco-buildings and a new elementary school were built that have a lower energy consumption than the national average level. 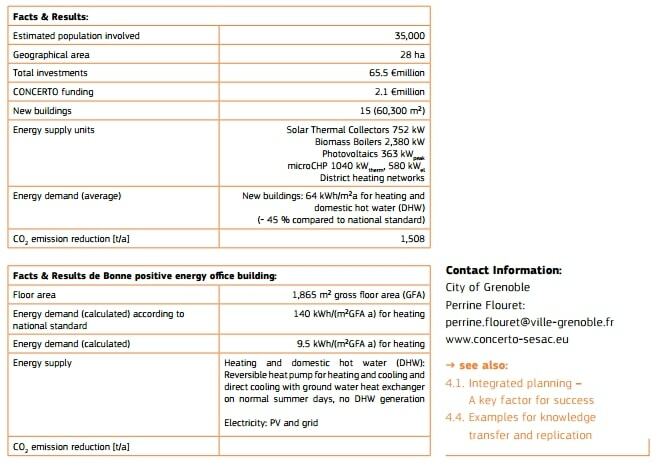 A special landmark in de Bonne is the positive energy office building, which produces more energy than it actually needs. It uses 70 % less energy than the value foreseen by French building regulations. The total gross floor area of the fourstorey office building is 1,865 m². The 425 m² photovoltaic power plant on the terrace and its concrete structure provide its main symbolic, architectural characteristics. The building was designed with a high compactness, an efficient external insulation, a high share of natural lighting and special attention was taken to avoid thermal bridges. The windows have very low-emissive triple glazing and automatic, movable external solar protections with tilting louvers. Furthermore, a special, innovative, internal shutter system has been integrated that is mechanically movable between the ceiling and the windows. This system is intended to seal the windows at night and at times when the building isn‘t occupied. When these shutters are closed, the heat transfer coefficient of the windows is 0.15 W/m²K.